I was in Zurich for only a few hours when I noticed something odd: Everything was closing down. I had spent the overcast morning at Fraumünster, enjoying the stained glass windows of Marc Chagall and regretting the loss of gorgeous Alpine views as a steely gray sky hung low over the city and the Zurichsee. But as I made my way down to Limmatquai, a noticeable change was afoot. Streets vendors began to stow away their cowbells and flags. Shops began to close their doors for the day. Vehicular traffic gradually gave way to merry brass bands, horse-drawn floats, and an inordinate number of camels wandering along the streets haphazardly. What, exactly, was going on here, in this most orderly and staid Swiss city? 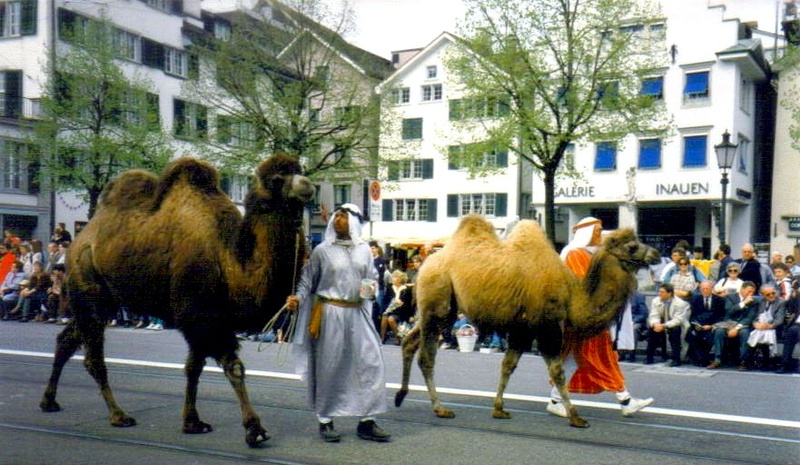 I soon discovered that I had unknowingly stumbled upon the Sechseläuten, Zurich’s traditional spring festival and a public holiday in only this city. I quickly decided that if I couldn’t enjoy the now obliterated views I had been looking forward to, I would take pleasure in a completely different type of outdoor activity. So I gained an advantageous viewing point under the twin towers of the imposing Grossmünster and settled in to watch the parade, a procession that has been held annually for well over a century. The street was soon filled with hundreds of participants dressed in the traditional garb of 26 medieval guilds, harkening back to the 14th century, when the guilds — powerful economic, military and political organizations — gained power that lasted for the next 400 years. Back then, one had to be a member of a guild in order to work as a craftsman, and the concept of freedom of trade didn’t break the guilds’ power until 1798. Guild members worked as long as the sun did during the winter, but once the warmer weather rolled around, work officially ended at 6 p.m. So the Sechseläuten (literally, “the six o’clock ringing of the bells”) was a cause for celebration, as the Swiss said goodbye to winter and were able to enjoy leisure time while some sunlight remained. The mystery of the presence of camels — and of their guides’ footwear — remained unsolved. 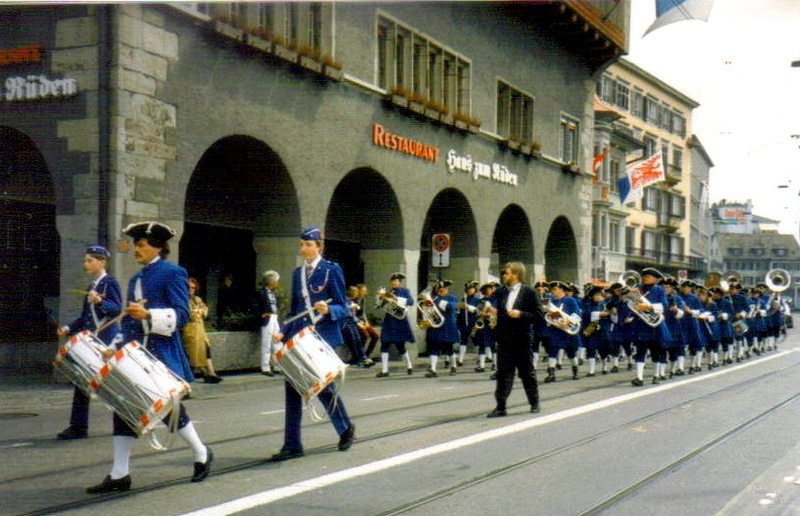 Accustomed to jovial, and sometimes rowdy, St. Patrick’s Day and Thanksgiving Day parades in my hometown of New York, I was taken aback by the composure of the Swiss, who were clearly appreciating the festivities, but in their typical reserved fashion. Occasionally, an extroverted individual would break ranks and run out to a guild member or a horn player to give him a kiss and a flower. The gesture was soon reciprocated: Marchers began tossing flowers to spectators. This curiosity took an unexpectedly dangerous turn when they started lobbing apples, melba toast, and hard taffy into the crowd. Although the tradition of edible grenades remained a mystery to me, I couldn’t help but wonder if it was some sort of compensation to make up for the jarringly expensive prices of everything here. And I still couldn’t figure out how the camels — or the men in traditional Arab Bedouin garments (except for the sneakers) who led them — fit in. The Böögg awaits his fiery fate atop a 30-foot pyre. The parade marched to its terminus at Sechseläutenplatz, where a snowman made of straw and cotton wool — the Böögg — stood atop a 30-foot pyre. Thousands of Swiss and foreigners alike — a Japanese couple to my left, some Brits to my right — clogged the streets to witness the final spectacle of the day: the burning of the Böögg. It was here that the Swiss finally broke out of their stoicism after six months of snow and ice. Some dangled on tree limbs; others clustered on nearby rooftops. A round of frenzied applause went up when the fire was lit at exactly six o’clock. Anticipation grew as the flames advanced toward the Böögg’s head. Once ignited, the explosives in his hat erupted to the sound of riotous cheers. And, just like that, winter was declared dead. Pieces of the Böögg floated down over Zurich for hours afterward. Although winter was now officially over, a very wet spring had arrived. But I remained cheerful as I walked in the drizzle, trailing the bands that had splintered off to perform in the city’s twisting alleys, apparently whenever the mood struck them. I rose with difficulty the next morning, my slumber disrupted by meandering bands that extended the revelry well into the early morning hours, including one particular tuba player who did not find it unusual to perform a solo outside my hotel window at three in the morning. But I also rose with a smile on my face as I had a singular thought: Who knew that you didn’t have to wait for your snowman to melt if you wanted to get rid of it?